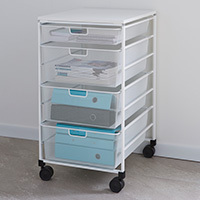 Our new slimline 25cm wide elfa basket drawer tower is ideal for slotting into small spaces in bathrooms, utility rooms or how about in a wardrobe for shoe storage. 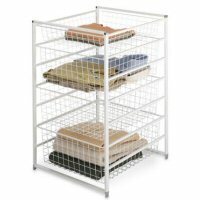 Robust 104cm high freestanding elfa basket tower in white. 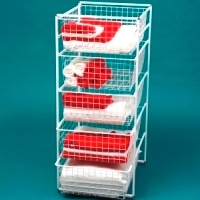 Great for linen or drying clothes in an airing cupboard. 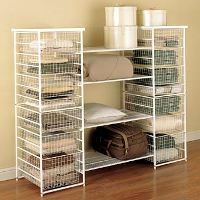 Also makes an ideal solution for folded clothes storage inside a wardrobe. 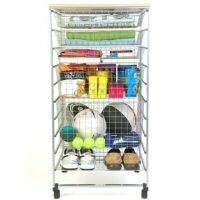 Our smallest (height) freestanding elfa basket tower is ideal for the bottom of wardrobe or in a cloak room for hats, scarves and gloves. 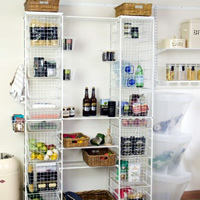 We also recommend this size for use inside kitchen cupboards. 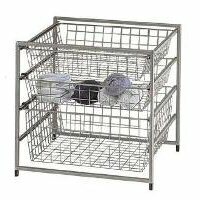 Our Robust freestanding elfa starter basket kit with tight mesh drawers is ideal for clothes storage, office supplies, food stuff, craft materials etc. 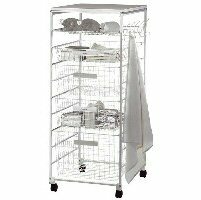 Whatever you choose to use it for this 104cm high extra voluminous 55cm wide x 54cm deep unit will really swallow that clutter! 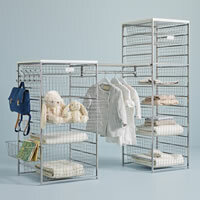 Our free-standing linen and luggage drawers from elfa offer the perfect answer when it comes to sorting out linen, luggage, sports equipment and are also great for toy storage according to our customers. 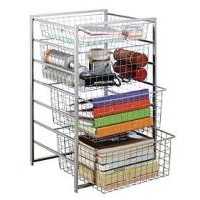 Our robust freestanding elfa starter basket kit in platinum makes an idea home office storage solution for all that clutter. 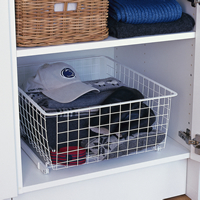 It's also ideal for shoe storage. 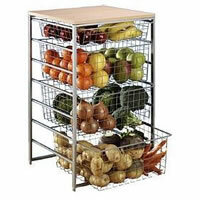 Our robust freestanding elfa starter basket kit in platinum is ideal for fruit and veg. 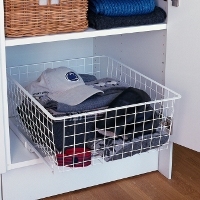 storage in any kitchen on pantry. 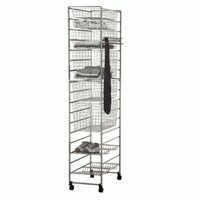 Free standing elfa basket tower storage solution with shelf and hanging rail. 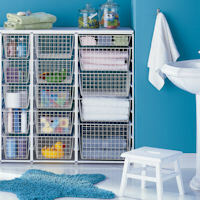 Great for use under the stairs, in the kid's room or under the eaves.